Q. What is hook and loop? A. Hook and loop is a touch fastener closure system. It generally consists of two strips, one with loops (the soft side), and one with pieces that “hook” (the rough side) onto the other strip. The hooks engage into the loop and provide the closure system. There are many types and combinations of hook and loop fasteners, call us and we can give you all the details. Q. How does Hook and Loop work? A. When the 2 sides are touched together hundreds of Hooks interlock with hundreds of Loops and this creates a strong bond. When they are pulled apart, the hook actually straightens out in so it can release from the loop. After is free from the loop, the hook returns to its natural shape. Q. How is Hook and Loop sold and can I just buy the one side? A. Our Hook and Loop Fastening Tape is sold on 25 and 50 yd rolls. You can purchase our products by the roll or by the case. The case size will vary depending on width and type of the product. Check our size chart for more info. You can buy just hook or just the loop. We understand that your application can vary and we are here to help. Need more hook, you got it! Only need one roll of loop, sure! Q: What colors can I purchase, do you dye to match? A: We stock 20 different colors, which are listed on our site under resources. We always have black and white of the floor, but we can custom order any color you may want. All special order colors are sold by the case. We can die to match as well. Our factory can match just about anything. Q: I am not sure what I should be using, help! A: Call us at 800.328.4747 and speak to anyone in customer service. We have trained staff that will be able to help point you in the right direction. Q. How does the hook and loop attach to my product? A. Hook and loop tape can be attached many ways. It can be sewn, glued or welded. Any fabric backed hook and loop can be sewn. If it has a pressure-sensitive or solvent activated backing you can glue it. It can be RF-sealed or welded as well. Call us and we can help you determine what it best for your application. Q. How do I know which type of adhesive is best for my application? A. The requirements for your project will determine if acrylic (PS-A27) or rubber (PS-A69) is best. It is going out side? Is it adhering to plastic or metal? These are the types of answers you will need in order to determine what’s going to work for your project. Any one of our sales executives will be able to help you determine which is best for your application. Q. My hook is has little pieces of lint or something in it. How do I clean it? A. The best way to clean your hook is with another piece of hook. Think of how you would clean your hair brush. You can use a stiff comb, but it will take some elbow grease! The hooks are made to hold on to stuff in and grab it. If possible try to keep the hook covered because it will grab anything that it comes into contact with. Before you wash any item with hook and loop on it, make sure they are mated together so when it won’t stick to anything else in the washer or pick up any lint in the dryer! Q: Can I get a larger roll than the standard 25 or 50 yards? A: Absolutely. We can order crosswounds or dispenser boxes to help with your production. A crosswound is a roll that is continuous varying from 500 to 1600 yards depending on the width. A Dispenser box is a box with four, six, eight or twelve, 100 yard rolls. The number of rolls per box depends on the width. Let us know what your application and production needs are and we can help determine what would best match your needs. Q. I need some material cut to length and a welded strap, can you do that? A. We can! 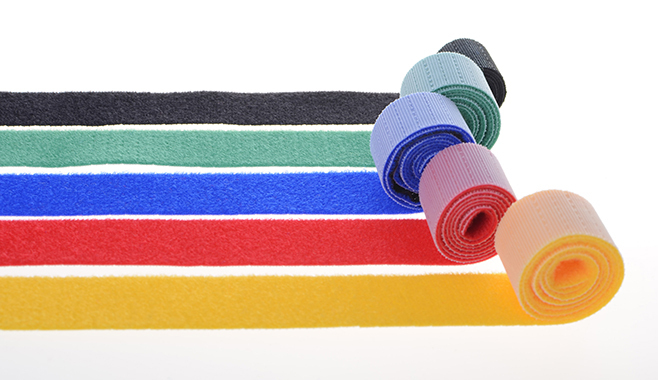 Paiho North America can cut to length, mate, die cut and produce straps in house. We can also make finished goods in our factories overseas; just let us know how we can help. Q. Where can I get spec sheet, MSDS and test reports on your products? A. We can send you whatever you need. We will just need to know what you’re looking for so we can get the correct information to you. Q: What carrier do you use to ship your orders? A: We can ship your goods via LTL, UPS or Fed Ex. We can use any carrier you prefer. If you have any other questions or concerns call us at 800.328.4747 or email us at sales@paiho-usa.com, we are always happy to help!